Through the loading process, external documents are filed in the right places in the SAP system with all necessary accompanying information. Our DMS Loader programs support SAP Document Management System SAP DMS (DMS Loader), SAP Folders Management (RM Loader) with records and cases, and the direct installation to SAP objects with ArchiveLink (AL Loader). While importing data you can create or edit target objects, add any amounts of additional information, and make SAP links. You can also create material BOMs for DMS Loader, using the appropriate templates. The loading process is performant, infinitely configurable, and can also by expanded for customer-specific checks and actions. Configurable feedback and control mechanisms ensure a seamless tracking of the process. 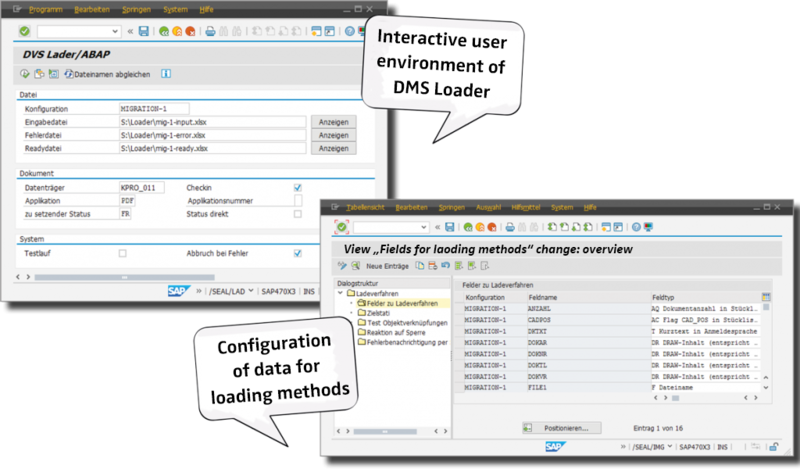 How can DMS Loader improve the processes? Along with document data you can create material BOMs with all information in detail. Documents and material data can be loaded together in one step. You can make document long texts immediately using the loading configuration default settings. The document’s output data (DRAW-ADATUM) is entered immediately. File name maximum length is the SAP standard value of 255 characters. The loading of additional files will be recorded. When creating new document versions, you can configure which data should be used from the previous documents. This includes classification, original files, document BOMs and object links. You can use both internal and external characteristic values. DMS Loader supports the deletion of characteristics with value checks. Emails can be sent to freely configurable email addresses, in the event of error. The sending of error mails to SAP users is also supported. The display of the application protocol takes place via SEAL Standard. This allows an interactive sorting and updating of the protocol. Via a user exit, you can change the loading configuration and use another pre-setting, for example, independent of input and user data. Linux systems are also able to read the loader files..
You’ll find further information on DMS Loader in our factsheet: Loading Processes for SAP. This may interest you: Solutions for Design in SAP.